Oxy-Klenza Challenge: Send in to Win! This home in the Netherlands is an entertainer’s dream. An expansive backyard contains a paved travertine patio and swimming pool. The owners of the home desired the surfaces to have protection against staining but the original look of the pavers had to be retained. 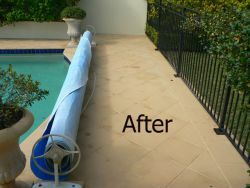 The wet-slip resistance of the flooring could not be affected either, especially around the pool surrounds. Planning on cleaning a patio or other outdoor area? 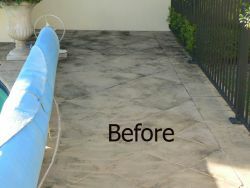 We’re looking for before and after pictures of a surface cleaned with Oxy-Klenza™. If your entry is chosen you will receive a pre-paid visa gift card valued at $250! Just email 3 high resolution (good quality) pictures (one taken before cleaning, one after and one with the product bottle) of the surface to marketing@drytreat.com with your name and phone number. Good luck! 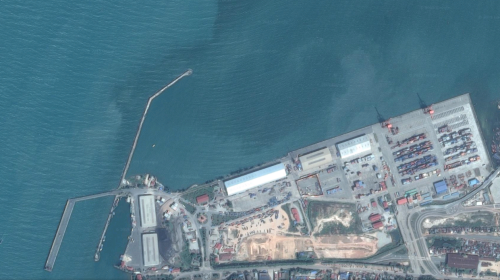 Ten years ago, an important jetty at the Sihanoukville port in Cambodia required some urgent attention. Constant exposure to dissolved salts meant the concrete structure was at risk of spalling and corrosion to the steel reinforcement. Fortunately, DRY-TREAT 100N™ was used to seal the jetty. The deeply penetrating, water-repelling sealer has provided the jetty with excellent protection for a decade, helping to ensure it is still in use today.